On top of all this, you’ll save a tonne on your power bills. Roller shutters add an extra layer of insulation to your home. This means that less heat enters during summer and less exits during winter. So, not only will you save money on heating and cooling, you can help protect the planet while you’re doing it. Roller shutters also offer an incredible design feature for your home. 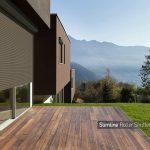 Potential buyers love the look and feel of roller shutters, so you should see a nice little uptick in price when it comes time to put your home on the market. Above all though, your home should feel impenetrable. Somewhere that you and your loved ones can feel safe. Security shutters give you this peace of mind. While keeping out bugs and weather is important, the most vital function of your roller shutters is to keep thieves and home invaders out. So, here are our tips on how to protect your home with roller shutters. It’s just not worth trying to install shutters yourself. A professional will know exactly how everything works, so the entire process will be much quicker and easier. Plus, if you try to install your shutters yourself, you risk undoing the primary function of your screens – security! The professional touch also ensures your product warranty stays intact – an essential for this investment. Roller shutters have come a long way, so don’t go thinking your home will look like a high-security prison once you’ve finished the project. You can invest in heavy-duty options that provide all the weather and security protection you need, while still adding to the exterior aesthetic of your home. From colours to design, you really are spoilt for choice. Your windows are usually the weakest point of a home. Burglars don’t break glass, this is too noisy; instead, they remove the frame of the window. This form of entry is particularly prevalent during summer when we are all leaving our windows open. Those flywires are good at keeping blowflies out, but they are also very easy to pry open. Roller shutters completely eliminate this risk. So, you can keep the windows open as much as you like and know that only you and your family are inside your home. If you want security shutters that will actually do their job, you don’t want to go with the cheapest option on the market. Go with a company that is happy to visit your home and provide after-purchase services like repairs. You should only deal with a company that is happy to give an upfront price for the product and the installation. You don’t want any nasty surprises down the track.